Sometime back, when we were living in the U.K, a very good friend, who also happens to be a single mother to two lovely children, visited us. Her ex-husband (with whom she is on very friendly terms) is an Artist and a very accomplished one at that.Over glasses of wine, soft music and a lovely hot dinner, conversation turned to art,creativity and other related things. "Creative people, be they artists or writers should never be allowed to marry or have children.They are so hard to live with!" exclaimed my friend with all gusto and complete sincerity. My friend has the highest regards for artists/writers and she does appreciate and admire them a lot. She is also a great book-lover and a delightful conversationalist. She also has a lot of artists as friends because of the nature of her work. (She works as a life model). Satish (my husband--somehow I hate the word 'husband'.He is more my friend and confidante) chuckled and completely agreed with her. They went on to discuss the eccentricities and oddities of creative people in general. I squirmed a bit inwardly, amused, tickled and at the same time slightly bewildered. By Jove, they were right! Whatever traits my friend described of her ex-husband were the very that were present in me! Satish and she had a hearty nudge-nudge-giggle-guffaw insiders laugh and I joined in too. Later, I wondered how much of it would be supported by scientific evidence. Was it really true that creative people are difficult to live with and difficult to have as a close friend or have a close relationship with? Dr.Mihaly Csikszentmihalyi an eminent psychologist, and an author of many books and more than 120 scientific papers, has written a superb analysis about the ten paradoxes of creative people. (click on coloured words to read it). When i read it, i found myself identifying with nearly all the traits mentioned there. Perhaps those who know me well will agree. The last three months, I have been living inside my new book completely. (and oh it is so hard! You really feel each character's emotions as you live their life) Today, I finally okayed the final layout, before it goes into print. I heaved a sigh of relief, but at the same time I feel so emotionally drained. My biggest strength and biggest fans have perhaps been my children. Today I told my son "Next month, mummy's SECOND book will be in all the book-stores in India, can you believe it?" "Wow Mummy." he replied. "I am so proud of you." And he gave me a big hug. It was all that I wanted to hear. This post is specially to thank those people who have totally stood by me in the writing and creation of this book. They know how difficult a journey it has been for me. I would not be exaggerating if I say that the book would never have got written without them. He hates even being mentioned but I simply have to. He was the one who read each chapter as soon as it was written and who would keep asking "When are you writing the next one? What is the progress?" Sometimes, just because he asked I'd push myself and write even when it was really hard and I felt like giving up. She is one sharp and intelligent woman and works as an HR consultant. She is one of my closest friends and I am so glad to have her in my life. She was so honest with her feedback and she helped a lot in early drafts. When I was in U.K and whenever the phone rang, it would usually be Mayank. He has called me up countless times (and still continues to call me). Whenever he called, I would take a break from my writing and would pick up the toys and make beds an do the general cleaning of the house as I talked with him on the phone. On the days that Mayank called, the house would be sparkling clean! Dr.Anubhav Naresh deserves all the credit for a superb cover that my book will sport. (It got finalised today and I will soon post a picture here.) He is a multi-talented person who is into many things including running adventure camps, soft-skill workshops apart from being a Dentist. Click here to get the links to all his sites. And the final thanks of course is to YOU, even the silent readers and subscribers, apart from the ones who regularly comment. It is your words that truly propelled the first book and it is your encouragement that goaded me on, to write my second. Watch this space or 'like' this page. HEy.. congratulations for sending it to print .. best of luck for the launch.. and do agree with the behaviour of creative person upto certain extent based few recent observations with people around me..
Been waiting all day for your post. I love the way you connect different people you meet in life to your personal experience! Hearty congrats...cant wait for the d-day! I love that title - very catchy & promising! Congratulations and All the Best for everything!! Wishing you success and smiles! Two thumbs up to you, preeti!, what is amazing is the way you balance a family and your multiskills. way to go, lady! awaiting the book at stores near home. Congrats and Best of luck for the second book. It seems that many people involves in the process of writing a book and the best thing is getting appreciation from our loved once. Piyush: Oh yes.Loved ones and their words do matter a lot. Asha: thank you so very much! BTW you are in bangalore right? Where do you live? SK: Oh yes..I can be such a pain and a nuisance (well sometimes) :P Ask my friends :P :)And yes, the pradoxes made an interesting read, didn't they? Priya: thanks! How lovely to know someone actually waited for my post!These people I mention in this post are my closest friends. wow....I am so waiting for your second book!! And Great going Preeti!! I got into reading blogs after a couple of weeks and I see this post first!! Way to go!! The title of the book is great - Life is what you make it. Only if all of us understood that soon enough. congrats on your second book! Writing a book does take away so much of your energy! All the best for your second book . I'll be coming back on 15th of March! I am following your blog form 2 months & i am really happy to have come across your blog.I am regularly loooking for your posts. I liked your posts on Parenting,mama moments. I want to read you book 32 bubblegum & candies had ordered one will read it soon. 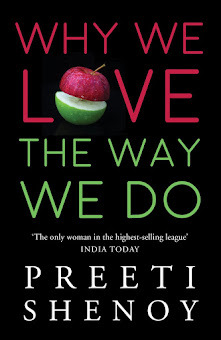 Congrats preeti for completing the second book. I am eagerly waiting for it to hit the stand. Oh I LOVE THE TITLE!!!! And I so agree on the 10 points about creative people ! No, I live in secunderabad, but have lived in bangalore. I have been waiting for your second book. I am sure I would enjoy reading it just like your debut. It was really nice of you to think of so many people who helped you to bring out your book, especially your family. I will email you to answer your question about the journal. I'll still do a post on it for you though! I LOVE the title of the book. I want all the information when it is published so I can let my readers know where to buy a copy. Keep inspiring me woman, as you have for so long. You make me want to go out and do great things with my own life!!! Congrats...All the very best!!! 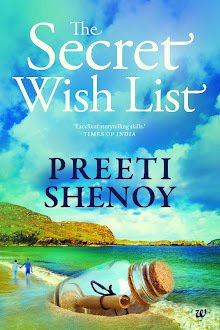 waiting to get hold of your book..
Good luck with your second book preeti !! Loved "34 bubblegums & candies"
Congrats Preethi !! Title is really promising !! Cant wait to get a copy :) ! Congrats preethi. I love your book title "Life is what you make it". So true and so right. Love the title of your book, when is it being released ?? Wishing U all the very best!!!!! !